You are here: Home / Tennis Equipment / Wilson Burn FST & KAOS Shoes Coming! Wilson Burn FST & KAOS Shoes Coming! 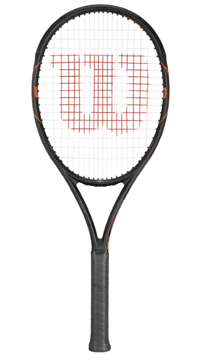 Wilson Sporting Goods Co., announced today the introduction of the BURN® FST (Fast Speed Technology) performance tennis racket and KAOS™ tennis shoe. This high performance tennis equipment duo has been specifically designed for “Generation Fast,” a bourgeoning group of modern, speed-hungry, aggressive, big hitting tennis players who play predominately from the Baseline. FST Octagon frame geometry allows air to flow around the frame and cuts through the air at any angle of attack for fast racket head speed. Patent-pending X2 Ergo Handle provides for an optimal, personalized feel on two-handed backhands. Nearly 80 percent of modern tennis players play a two-handed backhand, and for competitive juniors that number climbs to nearly 90 percent, yet modern rackets haven’t evolved to accommodate this change. Wilson Labs developed a player-directed handle insert system that allows every player to customize an ergonomic handle shape to optimize their grip. The X2 Ergo Handle provides the ideal form for the top hand to dominate the modern two-handed backhand. This gives players more power, versatility, leverage, and feel. High Performance Carbon Fiber offers increased frame stiffness for aggressive, explosive power. Racket throat features a textured feel on key touch points to allow for extreme grip changes. Sleek, stealth-like graphics with racing stripes highlight the unique geometry of the frame. The BURN FST collection includes the BURN FST 95, 99 and 99S. 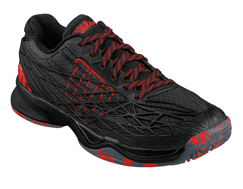 The BURN FST 99S includes the Company’s patented Spin Effect™ technology for increased spin. This technology allows players to produce significantly more spin without changing their swing. Designed for exceptional speed and agility, the ultra-lightweight, highly flexible KAOS shoe cradles and supports athletes’ feet allowing them to race from sideline to sideline. This shoe has been constructed with the latest materials and footwear technology to push the limits in the areas of velocity and stability, while providing best-in-class comfort. Pro Torque Chassis™ Light arch technology for more control, greater push off and faster reaction times. Unparalleled construction – both in materials, including SKINGUARD™ technology – and in the shoe’s modern, edgy aesthetic. Wilson Labs placed high performance materials on the forefoot of the shoe to provide support, enhanced responsiveness, and lateral stability and control. Dynamic Fit™ (DF2™) gives players the right level of comfort and ground feel via an extremely low-to-the-ground heel drop (9mm). Endofit™ Tongue provides an intuitive, comfortable fit, and added stability. The BURN FST will be available February 15, 2016 and KAOS shoe will be available at tennis specialty retailers (like Tennis-Warehouse) and on www.wilson.com on January 15, 2016. The BURN FST will retail for $249.00 (USD). The KAOS will retail for $125.00 (USD). For more information, please visit www.Wilson.com.